Feature The chip designers at ARM Holdings have turned the computing world upside down, shaken Intel to its core, pulled AMD into its orbit, and broadened its range beyond mobile into every nook and cranny of the digital world, from toys to servers. But where did this UK wonder company come from? How does it earn its living? And how did Apple help create the company that helped Steve Jobs save Cupertino from annihilation? At the recent ARM TechCon developers conference, ARM's training and education manager Chris Shore answered those questions and more – such as what "ARM" stands for. "ARM doesn't stand for anything," he said. "Officially, it stands for nothing. It used to stand for Advanced RISC Machines, which was the company's first name on its foundation. Prior to that it stood for something else – it stood for the Acorn RISC Machine, because the original architecture was actually designed by another company, called Acorn." However, when ARM joined the NASDAQ and London's FTSE stock exchanges in 1998, the name was officially changed to ARM – which stands for, well, just ARM. Shore said that he continues to be asked whether ARM makes chips – which, of course, they don't. They create and license designs for a broad range of chips. "If you phone us up and say, 'I'd love to buy a Cortex-A9, how much are they, please?' we can't quote you for a single device or even 10,000 devices – you'll have to go to someone like TI or Freescale or Samsung, who actually license and produce the chips, in order to buy one," he said. "But we could quote you several tens of milions of dollars for a license to build one of your own, if you wanted to." He also said that many people are surprised that ARM is a UK company [Some anti-UK prejudice, y'think? — Ed. ], seeing as how they play in an industry that's dominated by the US and the Asia-Pacific region. ARM was founded in Cambridge, where its headquarters remain today. Another misconception that people have about ARM, he said, is that many believe that the company knows all about how its licensees use its designs. "People put those into all kinds of end uses," Shore said. "They go into fridges, toys, wireless baseband modems, network switches, servers, tablets, phones – goodness knows what they go into." Not only does ARM not track what its partners – Shore's preferred term for licensees – do with their designs, some of those partners wouldn't tell them even if they asked. "We produce a lot of products in secure marketplaces for things like banking cards," he said, "and our partners in those fields are quite rightly very secretive about what they do. They certainly don't tell their customers that they use our IP, and very often they don't tell us what they do, either. They prefer to keep that very quiet, and keep it to themselves." 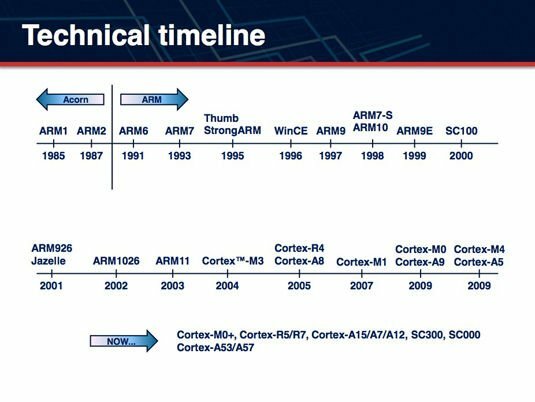 The ARM architecture didn't originate from ARM, the company. About five or six years before ARM was founded, a Cambridge company called Acorn Computers, which made desktop PCs primarily for the education market, was casting about for a processor for the next generation of their machines. Nothing on the market at the time quite suited their needs, Shore said, so they decided to design their own. "That processor was designed by a very small team of only four engineers," he said, referring to the group led by Sophie Wilson and Steve Furber. "One of whom designed the instruction set, one of whom did the microarchitecture, and two others who assisted with the designing of the supporting chipset." That tiny team produced the processor in 14 months, and it first ran code in Acorn's offices in Cambridge on 26 April, 1985. "And ARM still occupies that office." That architecture was called the ARM1, for Acorn RISC Machine, and went into a system that became wildly popular in the UK education market. "Everybody my age in the UK used one of those machines at school," he said – Chris is a middle-aged chap – but "they're long gone now." Acorn is long gone, as well. "It split itself up towards the end of the 1990s, and eventually the final pieces of it were bought by Broadcom and it now forms the chunk of Broadcom's research group." 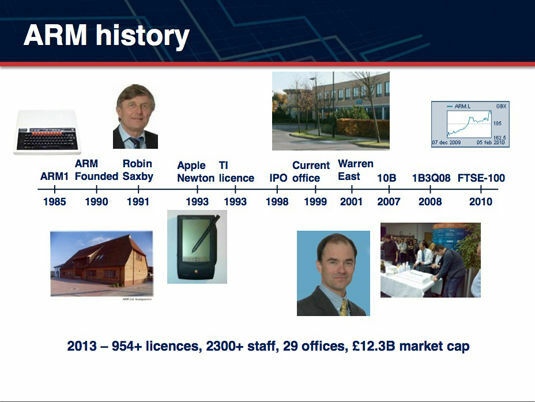 Its legacy, however, lives on in ARM Holdings, which was founded in 1990, headquartered in a farmhouse 10 miles (about 16km) outside of Cambridge. ARM's first CEO was Robin Saxby, who wasn't the founder of the company, but instead had been headhunted by the founders to run the show. Smart move, seeing as how Saxby came up with the licensing business model that has turned ARM into a global powerhouse. That business model was born partly out of necessity. With only 12 employees, it didn't have the resources to turn its chips designs into products. "Very neat design," Shore said, "but putting it through a fab and actually turning it into a physical product was a huge risk and a very expensive thing to do, and they simply didn't have the resources to do that." Those resources, by the way, were provided by ARM's first funders: Apple, Acorn, and VLSI. "It was well-funded, but not lavishly funded," Shore said, and so Saxby came up with the licensing model, which he essentially invented. "It's an industry that ARM has gone on to dominate. We effectively invented it, and for the last over 20 years we've been fortunate enough to dominate it." Although Acorn was one of ARM's original funders, it was actually their chip design and Apple's ill-fated Newton that gave birth to the company. "Apple, looking for a processor for that particular design, hit on Acorn's processor and loved it," Shore said. "They wouldn't buy it from Acorn because Acorn was a competitor in the education market, so between them they cooked up this plan to found a separate company to give Apple access to the design." That separate company was ARM. "It's interesting to see that ARM had three founding fathers, if you like, or three parents – Acorn, Apple, and VLSI – and we've actually outlived two of those," Shore said. "Acorn and VLSI are no more, and we've arguably saved the third." Shore is referring to the fact, as outlined in Walter Isaacson's Steve Jobs, that when Jobs returned to Apple and shortly took control of the company in the late '90s, Apple was in dire straits financially. As part of the turnaround that he helped engineer, Jobs raised a boatload of cash, Shore said, "by selling Apple's stock holding in ARM, which was worth a considerable amount of money. So arguably we've outlived two of our parents and saved the life of the third." According to Shore, although Apple's Newton was key to creating ARM, it wasn't the most important early licensee that the company snagged, "because the Newton wasn't a particularly successful product." That key licensee distinction goes to Texas Instruments, which licensed ARM IP for a mobile phone GSM chipset it was developing for Nokia, the first chip that combined both the application processor and baseband processor onto a single piece of silicon. "Nokia back then was the king of the mobile-phone industry," Shore said. "Sadly that's not the case anymore. Unfortunately, we're watching the slow death of the company, I think." TI's single-chip, ARM-based solution was so successful that Nokia soon adopted it across its product line. Soon, the chip was adopted by the rest of the mobile-phone manufacturers, and by the end of the '90s, ARM had a share of about 97 per cent in that rapidly growing market. "And that's a position that we still have," Shore said. "There are very few mobile phones that are not based upon our solutions." The year after joining the NASDAQ and FTSE in late 1998, ARM moved into its present Cambridge headquarters. Robin Saxby retired from the company after 10 years as CEO in 2001, and was succeeded by Warren East, who remained CEO for a dozen years. Simon Segars took over as CEO earlier this year when East retired. Those years have seen explosive – and accelerating – growth. In 2007, ARM announced that its licensees had shipped 10 billion processors, and in the six years since then they have shipped over double that number. In the third quarter of 2008, ARM had its first billion-processor quarter, and 2.4 billion processors were shipped in the second quarter of 2013. As of late October's ARM TechCon, the company had signed a total of 954 licensing deals, had 29 offices worldwide with major development offices in Cambridge; San José, California; Austin, Texas; and Bangalore, India. It was worth about £13.7bn ($21.9bn), and its partners had shipped 34.8 billion processors. "We entered the FTSE 100 in 2010," Shore said. "The FTSE 100 is like the Standard and Poor's index, it's the index of the 100 most valuable companies on the London Stock Exchange. And we're currently – the last time I looked – we are about number 35 in the top-valued companies on the London Stock Exchange; we're slightly more valuable than Rolls-Royce and slightly less valuable than Sainsbury's, the supermarket." ARM's IP – not just application processors, anymore – is everywhere. "If you look inside a typical ARM-powered product, whether it's a toy or a DVD player or a mobile handheld device, inside that you will find typically an ARM processor, possibly more than one – the average processors per mobile phone from ARM is approaching three these days," Shore said. "You will also find ARM physical IP in terms of cell libraries and memory compilers; and you'll also find ARM development tools and our modeling solutions that will have gone in to help the development of that product. So we produce more and more components that people use to produce ARM-powered products." All that IP adds up to big bucks. "Here's a really big number," Shore said, "$913m – that is our revenue for 2012," he said, "the last full year that we reported. I'm sure we'll break a billion this year, but $913m..."
So where does all that mazuma come from? If ARM doesn't sell actual, physical products, how does it rake in a billion bucks a year? "Everything we ship is essentially virtual," Shore said. "If you buy a licence from ARM, you get a massive tarball full of RTL," referring to the chip design's register transfer level description, which describes exactly how each circuit on the chip will behave and how each circuit is interconnected, "and from that it's your job to create a working processor design that can go into a working product." ARM doesn't need to worry – as does rival Intel – about spending billions of dollars designing and staffing chip-fabrication plants, aka fabs. How and where their processor designs are fabbed is up to their partners, who then sell the chips to middlemen, OEMs and ODMs. So how does ARM take its cut? "We make a large charge for the initial license – that is measured in millions, sometimes tens of millions of dollars for a licence to use one of our designs in a particular product or number of products," Shore says. 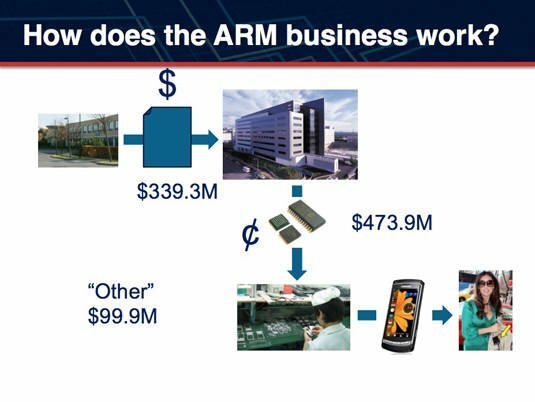 But that's not the only way that ARM makes money – in fact, it's not even where it makes the biggest chunk of its change. "Every time a company ships a device incorporating a bit of ARM IP," Shore said, "we charge a small royalty. That royalty is measured in cents per device" – averaging around 10¢ per device, he estimates. It's good to be a company for which $99.9m in revenue is considered "Other"
But do the maths. With ARM's partners' shipments approaching 10 billion per year, all those dimes – excuse us, 10-pence pieces – add up quickly. And not only do those royalties add up quickly, they also allow ARM to project profits into the future, seeing as how it gets money up-front when it charges IP licence fees, then pulls in royalty fees after that IP is turned into chips that make their way into products. Not a bad business model. Thank you, Mr Saxby. But from Shore's point of view, ARM is a bit of a boutique outfit when compared with the rest of the semiconductor industry. "We're used to working with companies that don't just have tens of thousands of employees, in many cases they have hundreds of thousands," he said. "And they have fixed-asset registers measured in tens and even occasionally hundreds of billions of dollars. In contrast – although we're the centre of a kind of spider's web within the industry, at the centre of this great partnership – we are actually a surprisingly small company." When discussing his company's 64-bit ARMv8 architecture, Shore revealed that ARM-licensee Apple's implementation of it in its A7 processor came as a surprise to many at ARM. "Our fruity friends earlier this year stunned the world, actually, and stunned most of ARM's employees, in fact, by releasing the latest version of the iPhone supporting and including a 64-bit processor," he said. "They'd done that incredibly secretly and ended up stealing a march on the whole of the rest of the industry. It was quite a staggering achievement, to be honest."